The K1 Restoration Resumed – At Last ! A few years ago I bought a K1 - KWJ 770 chassis number 458 back in March 2007 and promptly started to strip it down for rebuilding. 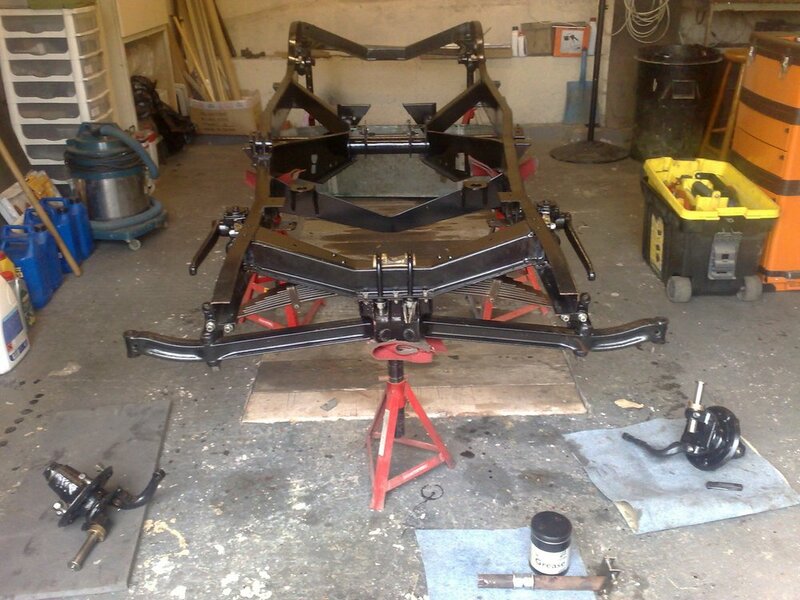 All was going well and the chassis rebuild progressed with much speed until….. we decided to sell our house and build a new one . Those of you who have ever embarked on such a task or have ever watched the agonies of those participating in such an endeavor will know that what you hope (and pray) will be a straightforward and enjoyable exercise never usually is. Now my background is architecture and construction so you would think (well we did anyway) that we wouldn’t fall into the pitfalls of others – no such thing! What started and received planning permission as a single story house with a roof height restriction very quickly became something larger and more complex. A first floor was added by further excavation and lowering the ground floor, adding complications with retaining walls, adjusting surrounding garden and patio levels etc, etc, etc. Having excavated further into the ground I then decided (or was encouraged by friends) to construct a wine cellar - it would have been cheaper to have bought a vineyard in France. I won’t go on, but suffice to say the house is now finished, we love it, but at the time it put paid to the K’s continuing restoration…we had other things to occupy us. Whilst all this was going on I made the decision to fit a Cadillac 331 engine into the car. I prised one from Dean Butler who had just bought it on Ebay in the ‘States, was an unknown and would likely need a complete rebuild so I approached Neil (Biggles) Bennet to rebuild it for me to hot road spec. Neil had rebuilt the Frenchie I have in my M type and is a whizz at hotting up flatheads. He holds a class record at Prescott and races at Pendine Sands with “Boz” his famous Flathead powered Batten Special . When asked whether he would be interested in rebuilding my ohv Cad engine he immediately agreed. He goes about things thoroughly with considerable thought, enthusiasm and an abundance of technical ability and the first thing he wanted to know was what I wanted to use the car for. “Hillclimbing” was my immediate response. Now I’ve never competed on track but having watched my Allard buddies (and Biggles) competing at Prescott and Shelsley I thought I must have a go, it looks fun. Whilst we were involved with our house build, Biggles researched the Cad rebuild and we agreed on the final spec. I wanted a good, reasonably fast and hopefully reliable engine with enough torque to hopefully worry Dave Loveys up the hills. Engine stripped and chemically cleaned. New forged 2618 alloy Venolia pistons heat treated to T6 for extra strength. Fitted with a purpose made “Rattler” Torsion Vibration Absorber. I also decided to fit a Jaguar gearbox and was fortunate in being able to tease a bellhousing adaptor and adaptor plate from James Smith to this end. I took the gearbox to Biggles for rebuilding as well and the whole assembly is now in the rebuilt chassis and looks fantastic with it’s polished aluminium rocker covers. The bodywork has gone off to be stripped and a new scoop put in the bonnet (Holley needs headroom) and I need to get a new wiring loom from Autosparks then the next stage can continue – don’t hold your breath for the next episode though I’m also refurbishing a boat . That’s all Folks, for now!